From the late 1950s, plans were made to radically redevelop the Wellington Hospital site. Many of the original wards and earlier additions were deteriorating, there was a perceived need for yet more beds, and, by the late 1960s, there was a proposal to establish a medical school facility in Wellington. In keeping with the concept of a modern teaching establishment, and in light of revised population projections, a 1200-bed hospital was planned. The complex would have included 6, 10-storey tower blocks, all interconnected, and an attached Academic Building for the Medical School. In addition, a new Accident & Emergency / Outpatient Block was to be built. This very large project would have seen the demolition in stages of most of the existing hospital buildings. The only buildings to remain would have been Nurses' Homes 2 and 3, the Nurses' Chapel (opened in 1965), the Seddon Wing, and the Resident Medical Staff quarters. The plan shows the Total Energy Centre at the centre rear of the complex. For Wellington city, the redevelopment plan called for a multi-staged building programme, beginning with Block A (the Seddon Wing), followed immediately by the demolition of Wards 1 and 2, and the erection of Block B - to house new Pathology & Radiology services. Stages III & IV involved progressive replacement of the remaining original wards with new Ward blocks. Over the next 17 years, various revisions of planning detail were made, but the original goal of replacing all of the original Newtown hospital buildings was preserved. In 1961, the plans for Block B included theatres, and 5 wards. This was not favoured by the Board, and a 6-storey block B was proposed with two floors each for Pathology, Radiology & Theatres. 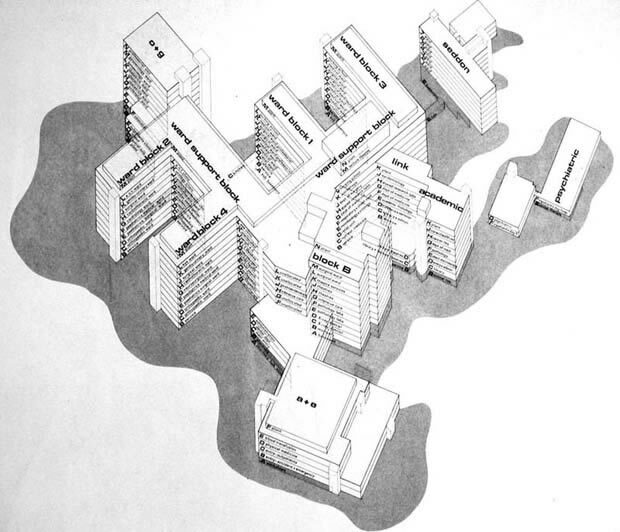 By 1964, the plans for Block B included wards once again. At this stage, the overall plan was for an 800-bed hospital in Wellington. Toward the end of the 1960s, the inclusion of a Medical School on the Newtown site was proposed. This required further re-planning of the Hospital redevelopment, and there were delays relating to a lengthy debate on whether there should be a full Medical School or a Clinical School only. In the end, however, the plans were radically down-sized. There were multiple reasons for this, including an abrupt decline in the nation's economy in the early 1970s. Also, the project was delayed whilst a vigorous debate was occurring over whether Wellington would have a full (3rd) Medical School affiliated with Victoria University, or an Otago University-linked Clinical School. By the time the latter option was chosen, a rethink about bed number requirements had taken place. There was still a need for significant redevelopment however, and thus the Academic Block went ahead (opened in 1977), followed by Block B (Clinical Services) and the O&G Block (Grace Neill) - both opening in 1978, and lastly the Ward Support & Link Blocks (1980). Once redevelopment plans had been finalised, the process of making way for new building commenced. Significantly, this included demolition of the original Toxward hospital of 1881. 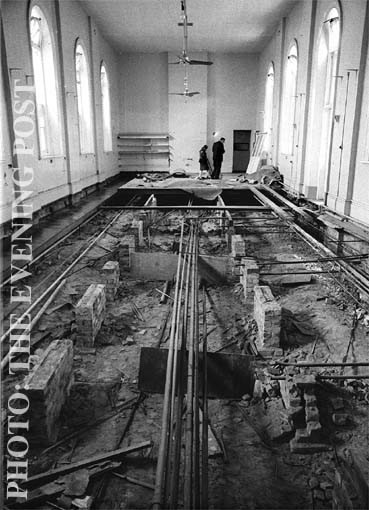 In the first photograph in 1968, the kauri floor of Ward 3 has been removed. 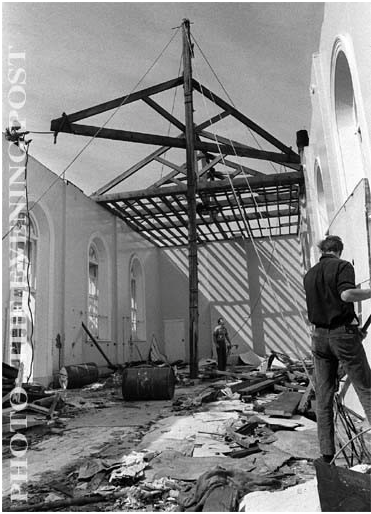 The 1969 photograph below shows removal of kauri roof trusses from Ward 2. 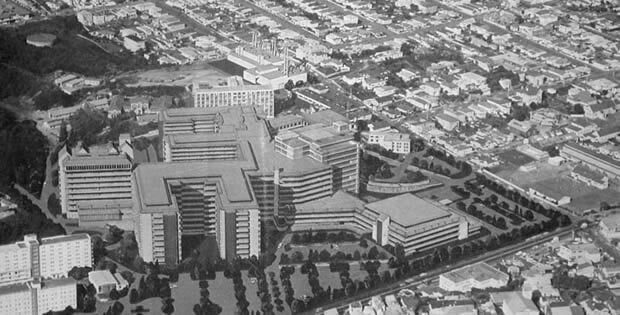 By 1978 the O&G building (later renamed Grace Neill Block) was well underway (centre-left of photo below), Block B (Clinical Services Block - CSB) was completed but not yet occupied (center-right), construction had begun on the Ward Support Block (behind and to left of CSB) and behind and to right of CSB are the completed Academic and Link Blocks. Top right is the excavated site preparatory to the erection of a Total Energy Centre (gas-fired power station). By 1980, all major building work was completed as this aerial photograph shows (directed toward Riddiford St). The Total Energy Centre construction is underway (bottom left).